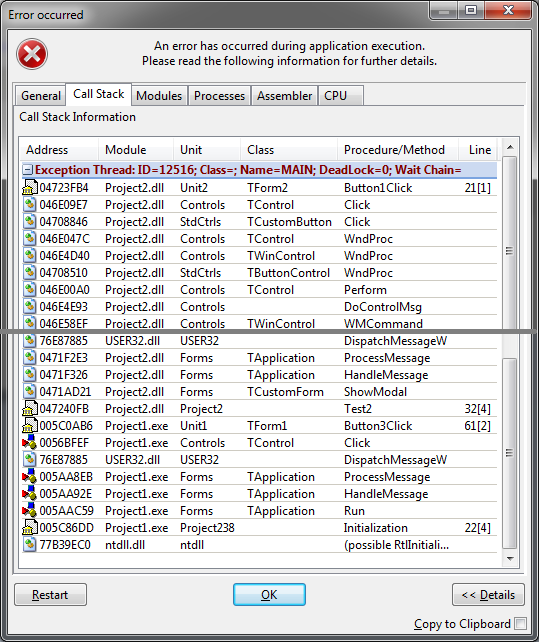 Create new DLL project, enable EurekaLog and set application type to "DLL". Since we're going to use forms in our DLL - go do Advanced/Code/Hooks page in EurekaLog project options and enable "VCL Forms application" option. As usual - we are using EBase unit to handle exceptions. 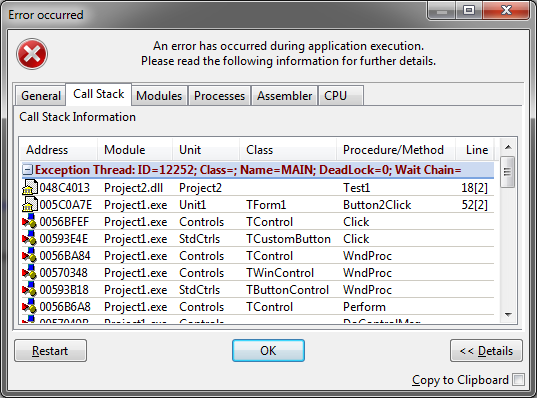 The first function in our DLL will just raise exception in DLL function. Basically, it is the same as second function in our previous example. Second function will create and show a modal form. There is no exception inside function itself, but form contains button to raise exception. This exception will not be catched by our try/except block, because exceptions in form's event handlers are handled by VCL framework. That's why we need EAppVCL unit (it contains hooks for VCL). Try/except block in second function will catch exceptions only for form's creating or destroying. Button #3: Exception was raised by form. It was handled by VCL.